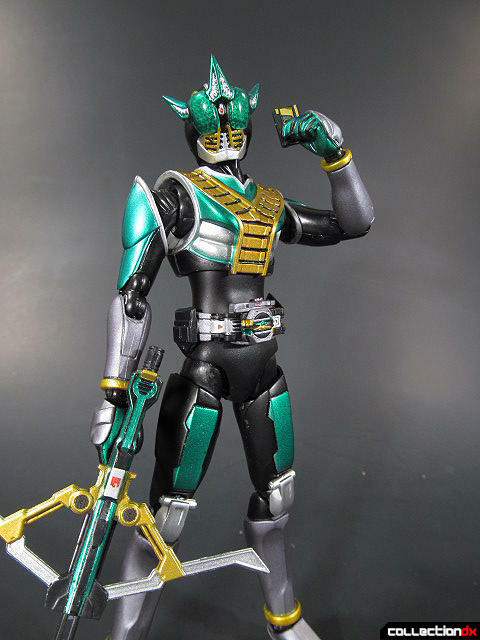 Kamen Rider Zeronos was provided for review by Angolz! Grab one there while you can! 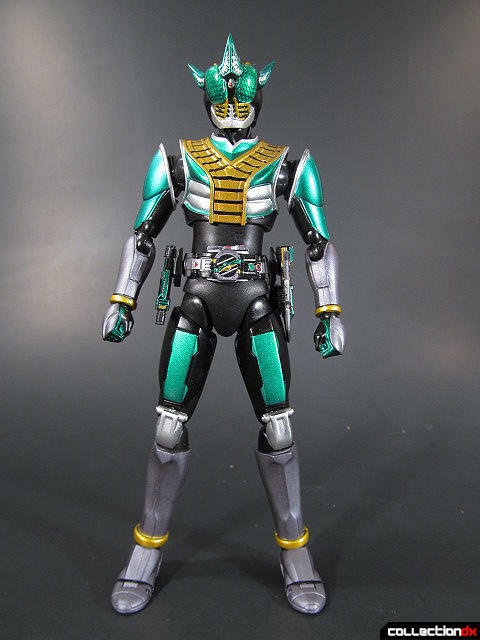 Let me say this to start, Kamen Rider Zeronos is one of my all-time favorite Kamen Riders! 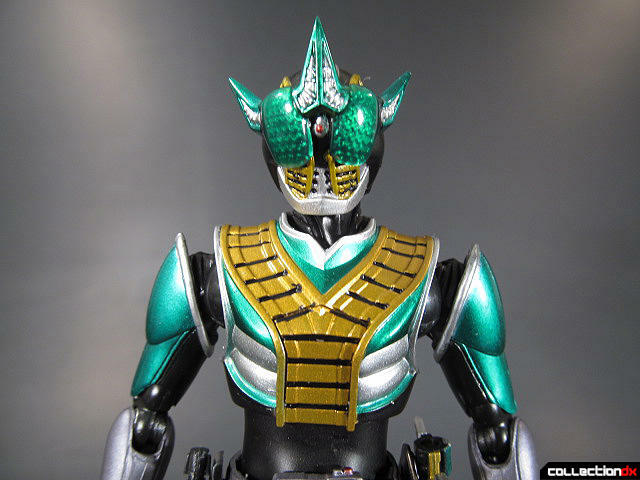 Zeronos was the secondary Rider in 2007's Kamen Rider Den-O! Yuto Sakurai is man who loves his astronomy, and hates his shiitake! Without giving too much away, he is under a constant burden to protect the flow of time no matter the cost, even when people's lives are in danger. Despite his initial brutish character traits, he slowly transforms from a cool antihero to a cool bratty manchild. For an in-depth overview of the figure, check out the accompanying video review! Let's take a look at the figure! As you can see, he is a gorgeous shade of emerald green. It's hard to capture it in photos, but the accents on his chest have a glorious sheen! As with most other S.H. Figuarts, the details are crisp and screen-accurate. The sculpted detail is beautiful and I can't seem to find any flaws in that department. His articulation is the standard for Figuarts. Everything is double-jointed and has a wide range of motion. He even has the amazing new ball-joints in his feet that we first saw in Kamen Rider New Den-O. The only negative aspect I can find here are the shoulders. His shoulderpads are so big that it really hinders his shoulder joints. It's something that happened due to the design of the actual suit, but I wish something could've been done to give me those few extra millimeters that I wanted. Even still, his arms retain a decent range of motion. He comes with a WHOLE bunch of accessories! Seriously, I don't think there's a single thing missing here. At his disposal are two sets of holsters (one with the ZeroGasher attached and one that's empty when he's using it), a tiny ZeroGasher split into two parts for storing on his belt, ZeroGasher in Bowgun Mode and Saber Mode, two belts (one with a card inserted and one without), a Zeronos Card, and FIVE and a HALF sets of hands! He has fists, holding-things hands, calm hands, card-holding hands, a pointing hand, and a gun-holding hand. There is seriously nothing I couldn't do with this guy! Any fan of Zeronos NEEDS to own this guy! It is the definitive representation of his characte.! I would even recommend him to people who have never seen the show because his design is just so clean and shiny. His strengths far outweigh my gripes with the shoulders. I may be biased due to my love for the character, but this is now one of my all-time favorite Figuarts! What are you still doing here?! GO BUY HIM. So is Zeronos > Den-O? I'd say yes. Absolutely. 100 percent. 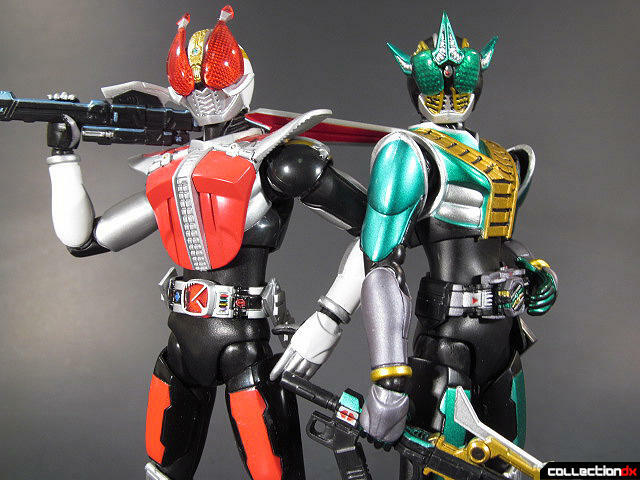 They need to make transforming Kamen Rider Den-O and Zeronos helmets in that gashapon scale. I love how the armor and visors transform in that series. The Zeronos Altair helmet also has to have a sound chip so that it moos when it transforms.